Open When Voice Card! Perfect Love Gift & Stocking Stuffer. Long Distance Relationship gift for Husband, Wife, Boyfriend or Girlfriend! 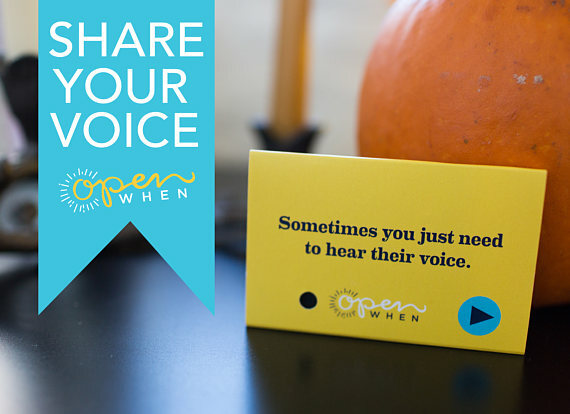 Introducing our new Open When Voice Card! This is a perfect little love gift on it’s own or a great addition to our Open When boxes and mini-packs. These cards are super easy and fun. You hit record, leave a message and give it to your loved or friend. They hit the play button and hear your message. Then, whenever they need to hear your voice you’re right at their finger tips. Creating a very unique and custom Open When! This voice card can record more than one message so if you mess up the first time don’t worry, try again until you get it just right.